Voila, another new beverage is here in Malaysia! This time it is cheese added to your drinks. 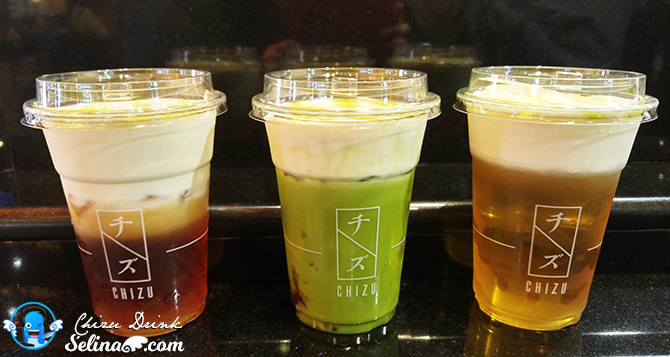 Chizu is the latest Japanese beverage....You know, the Malaysian people are crazy about the Japanese Cheese tarts, bread and cake...then now, they get a newly-Cheese drink, named "Chizu Drink" which are located in Sunway Pyramid, Malaysia! Chizu drink are the Japanese's phrase word, means "Cheese" drink. They launched first outlet at Sunway Pyramid, and also invited some local celebrities, and VIPs for the ribbon cutting ceremony at their grand launching event on last March 2017. Wow, my good friends, James, Woan Koon and I shocked when there are really a lot customers already be in a very long queue...to get FREE Cheese Tea, but when we love to order the premium cheese drink, the staff advised that we given the 3 type of Cheese Tea only, such as Chizu Roasted Oolong Tea, Jasmine Tea, and Matcha Green Tea only. 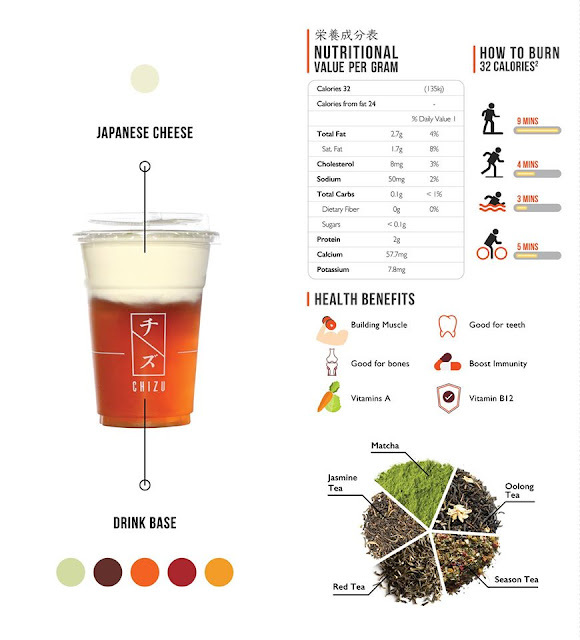 Chizu's coffee and tea are specially hand-crafted with the natural frothy Japanese cheese foam, creating a fashionable taste of lifestyle. Just one of 3 type that you can pick; regular (normal), less cheese or super flavour if you are cheese lover or non-cheese person. Well, the Japanese cheese foam also are topped on the tea drink! The recommended way to drink this chizu drink is to tilt the cup 40 degrees so that the white frothy cheese foam will stick onto your upper lips making it look like you have a white mustache so cute! I recalled that we, sisters used to be kids, we love to drink the white foam of milk, then we show off our white of 'mustache' to our parent. 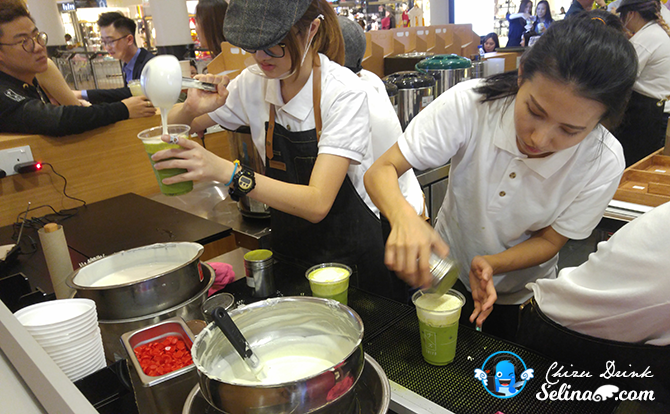 First the beverage is being prepared, then the frothy mixture of cheese foam is added on top of the prepared beverage. 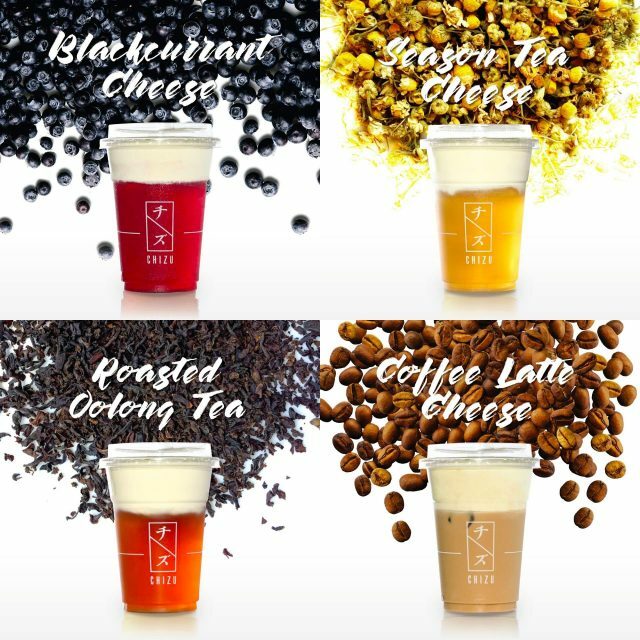 Next time, you can have the popular Cheese Tea, that are Jasmine Green Tea, Premium Red Tea, Season Tea and Japanese Roasted Oolong Tea and can request for extra cheese or less cheese to be added. Then there are the signature Cheese Drink such as Blackcurrant Cheese, Cheese Coffee, Chocolate Cheese, Matcha Red Bean Cheese and Orea Banana Cheese. Again, here if you like less cheese it will be cheaper and the Super flavour of additonal cheese is RM15-RM16 each. There are desserts being sold too, the Chizu cake and also the cheese tart. Well, with Chizu specialing in cheese, I think I might try the cheese tart one day. But upon closer inspection, the size is small. 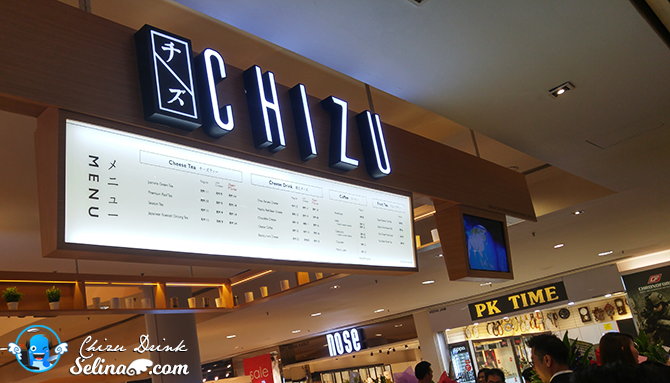 You only get 3 for RM15 or 5 for RM20 from Chizu Kiosk. I also heard that they have the kind of cakes looks like "sushi cake", and assorted petite pasries. They also explained about the nutritional drinks also get the good health benefits too. Oh ya! 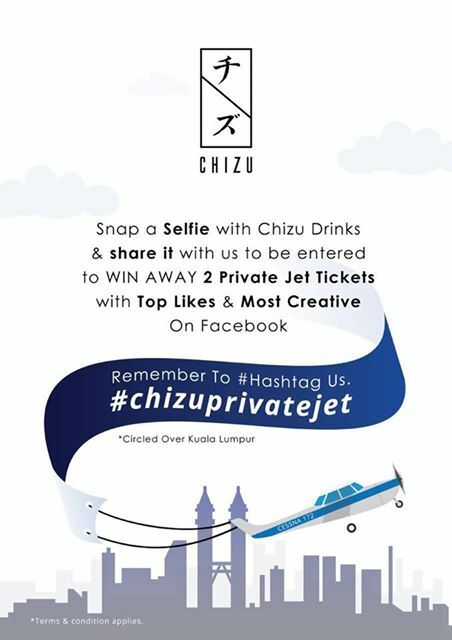 Just try your luck to send your creative photo to win a private jet, then you write a hashtag #chizuprivatejet! Only for the most creative and top likes winners on Facebook. What are you waiting for? Just ENTER NOW before 31 April 2017!